2012 was a very interesting year in the property management industry and real estate as a whole. The number of homes managed by the average property manager increased by 20% while vacancies were at record lows and rents began increasing in Idaho and the rest of the nation. With the almost overwhelming growth this past summer and my arm injury on Mother’s Day of all days, I’m sure I will forever remember this past year as a turning point. I also decided to step up my activity in the community this past year by getting involved in some volunteer programs, becoming the Survey chair for NARPM, and attending a variety of events such as the Idaho Housing/Economic Conference and the regional NARPM convention. Needless to say, it was a very busy, very productive year. All that hard work certainly paid off this year however as we saw an extremely low vacancy rate of 1.12% for the year. With a few exceptions mostly in the winter, we were doing 3-day turnovers this year. I’m very grateful for our vendors who made our properties top priority even at the busiest of times; with the high demand from property managers at the beginning/end of the month, that priority was crucial to getting rentals turned over and quickly ready for our new tenants. 2012 was the first year I decided to officially track renewal rates. Given the significant percentage of homes managed in close proximity to Boise State, averaging a 60.27% renewal rate for the year was quite respectable. Between rental rates being on the rise and what would appear to be a renter base increasingly aware of the cost of moving, I suspect this should be a rate that can be maintained or even improved upon as the effects of some value-adding programs for tenants are realized. The holiday season is officially upon us and immediate demand for rental housing is nearing its customary low for the year. It always surprises me how few property managers and landlords make a significant effort to avoid vacancy as much as possible in these slowest months of the year. I’m very grateful that all the investors and homeowners I work with have been quite open to my efforts to coordinate lease renewals in more favorable months. As a result of those efforts, November’s vacancy rate was 1.7%, with the 2012 average vacancy rate staying steady at 1.13%. 2011-2012 history illustrated below. November had a 50% renewal rate with an average 4.7% increase in rents among renewals and new leases. For 2012, Legerity Property Management’s renewal rate currently sits at 61.11%. As the weather cools and the holiday months begin, we start to see the demand for rental homes decrease. As such, Legerity Property Management only had approximately 4% of its inventory up for renewal in October. With most of our leases locked in/extended until the winter passes, October is usually a low vacancy month. With less than a 1% vacancy rate for the month, the year-to-date and 2011 comparison may be viewed below. October had a 66.67% renewal rate with an average 3.45% increase in rents for renewed leases. Legerity Property Management YTD renewal rate is now at 61.43%. I had hoped this would be an even higher rate this year; however, as equity positions improved, we did have many leases on single family homes that were not able to be renewed this summer due to owner-occupied purchases. Ada County home rental vacancy rates continue to display great strength at 3% among 4042 units sampled. Canyon County still lags behind with rates more in tune with national averages: single-family at 4% and multi-family at 8% for an average of 6%. Although demand for rental homes was very high, rents in the survey remained relatively flat with marginal fluctuations reported for each home size. As seen in the chart, rental market vacancy rates have improved significantly in recent years for the greater Boise area. Our vacancy rate at this time of year is typically very low as we have very little turnover in the colder months. At the moment, our vacancy rate is 0% although we’ll be adding a few properties here soon. It is actually an odd feeling having no vacancies, so give me a call if you know someone that rents out their own properties or if you are looking to acquire new investment properties! I would be glad to be of service and help plan for next year and beyond. The 2011/2012 year-to-date vacancy chart below reflects an average vacancy rate of 1.09%(~4 days) for the year so far with the peak in the summer when most of our turnover occurs and we added some properties that were already vacant as we assumed management. We’ve always made our best efforts to have the majority of our leases renew in the summer months as it was believed that it would not only allow us to fill vacancies faster being during the period of peak demand, but that rental rate evaluations would be more favorable in the summer months when move-in specials and the like are far less prominent. I am sure this is at least part of the reason that our rentals actually saw some rent increases this summer while the average among property managers was pretty flat. 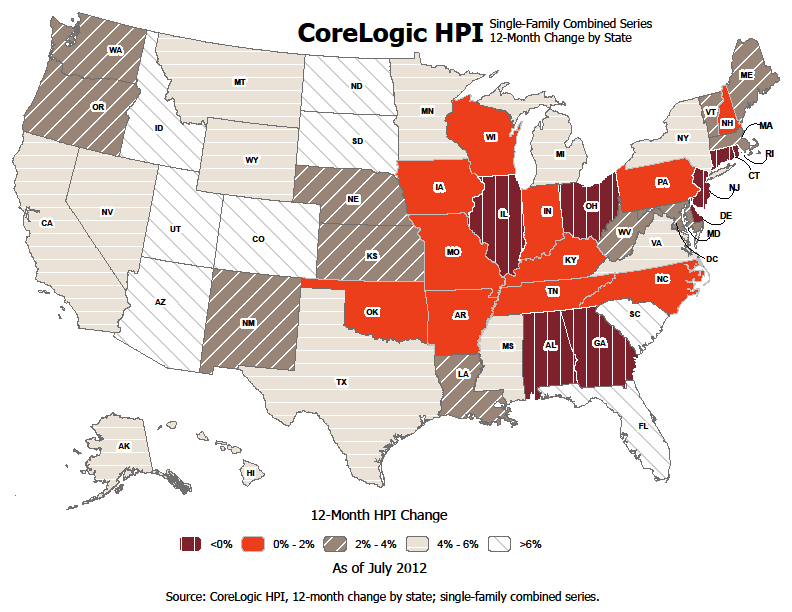 Second only to Arizona, home sale prices increased 10% from July of 2011 to July of 2012 in Idaho. When excluding distressed sales, Idaho home values rose 4.7%. This 5.3% spread is likely explained by banks getting smarter and allowing for the bidding wars we’ve been seeing on properties in high demand. As fair competition has mostly been restored on these distressed sales, it’s natural to start seeing prices more closely resemble fair market values. In the past, many banks would simply take the first offer and wouldn’t even look at any others, which allowed for a lot of large equity stakes and higher than usual CAP rates to be instantly had by investors. With the average national increase for the same period at 3.8%, Idaho’s market is recovering at an excellent rate. Rents in Boise, Meridian, Eagle, and Kuna are on the rise, vacancy rates favor the landlord, and interest rates are still at record lows, making now an excellent time to optimize the performance of your investment property portfolio. With the growing need for increased mobility and flexibility, we’re seeing a greater preference to rent rather than own, resulting in incredibly low vacancy rates. As long as the new construction market doesn’t overbuild, which is somewhat unlikely given the credit restraint that it faces, we’re likely going to enjoy extremely low vacancy rates for at least another year and gradually see an increase in rents during that time as the housing demand outweighs supply. Legerity Property Management is currently at a vacancy rate of 3.75%. We did just recently take on many new vacant properties however, which highlights the importance of listing properties before they are vacant. Year-to-date vacancy rate is at 1.47% for a more accurate reflection of performance. Typically, around 80% of our turnover for the year is in the May-July time frame, so we typically experience higher vacancy stats in the summer months. Historically, a balanced rental market is considered to have around a 6% vacancy rate. Currently, we’re seeing very moderate rent increases averaging about 2% with Ada county properties being nearly twice that while Canyon county drags the average down with nearly flat rents. Many of our properties were above market rents and many of the rest are on the upper range of fair market rents, but with vacancy rates so low, we would expect to see greater rent increases. Our lease allows for an automatic rent increase of 7% as the lease renews unless otherwise agreed upon. Many residents when confronted with the rent increase, made it clear they would move before being subject to the increase. In these cases, we do our best to strike a balance between the homeowner and the tenant’s budget on a case by case basis. Most of the time, we still collected a more moderate increase, the resident was glad to stay, and we avoided the expenses associated with turning over the property. It’s definitely worthwhile to consider these turnover costs when negotiating rents, and it has worked in our favor this year. Should wages improve as unemployment continues to drop and vacancy rates are low, we should have an environment conducive to even greater rental rate increases. As the financial markets have changed along with investor sentiment these past years, we’ll have to keep a close eye on whether that 6% vacancy balancing point has changed. Reducing vacancy rates is one of the most significant methods to increase investment property performance if it can be done without compromise. Here’s hoping we can look forward to an era of greater efficiency in the rental property market. The most recent NARPM regional convention was hosted here in downtown Boise this year. I attended a maintenance class headed by Tony Drost that was quite informative and brought up a number of simple, cost-effective ways to improve tenant safety and limit potential liability for property owners. Although Boise is quite safe compared to much of the world, Legerity Property Management will be rolling out some of these new maintenance policies as properties are turned over. As most of my clients are aware, vacancy rates are looking very good for this year and the general sentiment among property managers is that Ada county vacancy rates are unusually low and properties are renting faster with people more often showing up with a deposit ready, albeit at relatively stable rents, while Canyon county is still lagging behind with relatively average vacancy rates. I look forward to seeing the actual vacancy statistics for the second quarter as I suspect it will be one of the better summers on record for property owners. The Associated General Contractors of America released their material cost publication last week, and The Idaho Statesman also published an article on rising costs. The AGC of America report also included a forecast based on a comprehensive set of variables. Its current estimates are a 4%-9% increase in material costs for 2012 along with a more steady 1.5%-2.5% increase in labor costs. 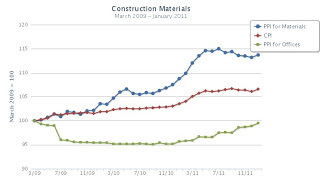 Construction costs naturally rise over time as inflation takes effect, so many people have suggested that the government’s infusing/printing of money in recent years is largely responsible for the increase in material costs. Although it certainly has a significant effect, particularly when importing materials from certain countries, the graph below shows us that the Producer Price Index(PPI) for construction is rising at a higher rate than the Consumer Price Index(CPI). As unemployment and wages have been a limiting factor in rental rate increases, it’s always encouraging to see signs that these restrictions are diminishing. 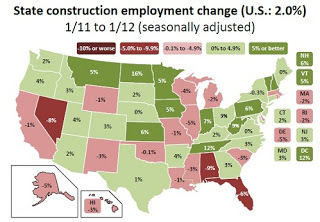 The map below illustrates construction employment year-over-year changes for January and places us with a relatively moderate growth rate. The full AGC report available here is quite informative and addresses data regarding new shale gas resources, population change, construction unemployment, material costs, and some supply/demand topics both foreign and domestic. Furnace filters play a vital role in extending the life of the HVAC system and reducing service call costs. With preventative maintenance inspections right around the corner, I'd like to highlight the importance of one of the commonly addressed issues and give some insight into the quality variance of filters. The Legerity Property Management lease agreement states that tenants are responsible for cleaning or replacing the furnace filter and that any service calls directly attributed to lack of said maintenance will be billed to the tenant. As such, tenants are always asked to replace the furnace filter before submitting a maintenance request for HVAC issues. Tenants are educated briefly about the importance of furnace filters during lease orientation, often again upon moving in - showing those that are unfamiliar with proper maintenance, and then again if needed during maintenance inspections. Furthermore, common filter sizes are on hand during maintenance inspections so that we can replace them right then and have the tenant pay for the filter accordingly. Additionally, if the tenant uses filters for each individual air vent, they are asked to discontinue their use as they restrict airflow and aren't capable of filtering anything a quality furnace filter wouldn't have collected already. All tenants are referred to The Filter Factory, which has all sizes, levels of quality, and most importantly free delivery and an automatic delivery program, so even if a tenant forgets between inspections, they have a filter coming their way automatically. What makes one filter better than another? The two primary considerations of any furnace filter are how well they protect the furnace assembly by trapping airborne particles and how much they restrict airflow. Filters least effective in the former actually restrict airflow very little, causing less pressure drop after the filter, but do little to protect the furnace components. Clearly, balance is key. In most cases, a pleated filter with the greatest possible thickness is going to give us that balance, but let's explore the options on the market and variables that may affect filter choice. For residential units, we have three kinds of filters: fiberglass, washable electrostatic, and pleated. Fiberglass filters are the cheapest and are the least effective, only filtering large particles accounting for about 10% of airborne particles. Molds, pollens, and other small particles pass right through. In short, they should never be your first choice except in rare situations where airflow is limited. Washable electrostatic filters are slightly better - filtering between 15 and 25% of particles. Pleated filters are the ideal choice although they have air pressure drop considerations dependent on their MERV rating and thickness. The MERV rating denotes the size of particles the filter collects and how effectively they do so. The higher the MERV rating, the smaller the particles it can collect. The commonly recommended MERV 8 filter can effectively collect particles in the 3 to 5 micron range, which includes molds and some allergens, while MERV 11 can collect particles in the 1 to 3 micron range, including insecticide dust, paint pigments, copier toner, and some bacteria/organic contaminants of concern. Air pressure drop, caused by the air resistance of the filter, has a negative effect on system performance as the system has to work harder as the airflow is restricted, causing additional wear. Furnaces are designed to operate with some pressure drop, but the less resistance, the more efficiently the unit is able to work as it has to work less to circulate the air. The MERV 8 is most commonly recommended because it has a good balance of filter performance and air resistance while the MERV 11-13, particularly popular among those with allergies and others concerned with limiting some pollutant exposure, does indeed restrict airflow more than the MERV 8, so it becomes more important to be sure it isn't allowed to get too dirty before replacing. The smaller the particles the filter can collect, the more air resistance you can expect generally; however, the thicker the filter is, the less air resistance/pressure drop. Pleated filters usually come in 1", 2", 4", and occasionally 5" thicknesses. Although furnaces typically have racks installed that only accommodate a 1" filter, there are major advantages to thicker filters. First, a 4" filter has 4x the surface area of a 1", so the air can more easily pass through, meet less resistance, and cause less pressure drop, improving system efficiency and potentially reducing wear and the utility bill. The second major advantage is that with increased surface area comes a greater capacity to hold particles over time. Whereas most 1" MERV8+ filters should be replaced every 2-3 months, a 4" filter has a lifespan more along the lines of 6-12 months. With the thicker filters, the wear and tear from the filter not being replaced right when it should be is of considerably less consequence, which can be important when inspections are being done roughly every 6 months. One other way that some systems improve surface area is by putting 2 filters in a V-shape, doubling the filter media surface area. Putting two 1" filters on top of each other would NOT increase surface area, but would greatly increase the pressure drop as the air would meet twice the resistance as it has to pass through two filters instead of one. In summation, using the thickest possible pleated filter with a MERV8-MERV11 rating and ensuring it is changed at proper intervals equates to a longer lifespan for your HVAC system and cuts down on repairs during its life caused by debris accumulation on system components. For new construction and installations, ask for a 4" filter rack/access whenever possible. In 2011, Legerity Property Management was able to implement small rent increases on many units throughout Boise, Meridian, and Eagle - primarily those in the more desirable areas of the valley and those units with above-average finishings; however many other homes did not command rent increases. Among all landlords throughout the valley, rents as a whole turned out to be relatively flat(compared to the change in vacancy) on average, with Ada County outperforming Canyon County in pretty much every conceivable measure. With the 2011 decrease in available inventory and lower vacancy rates, we would expect rent increases to be greater than they actually turned out to be. The populace's ability to pay is always a factor of course and a probable cause for the overall less-than-expected rental rate increase in 2011. Improvement in the unemployment rate, should it continue, would likely be a factor in rental rates increasing for 2012 as the competition for good workers, and thus wages, increases, bringing our expectations into alignment, however gradually, with what we can usually infer within the relationship of vacancy and rental rates. Legerity Property Management employs a couple databases used by Boise property managers in addition to our own inventory data to first establish an average or baseline rental rate within the past year for the property in question. Much to my personal dismay, rental rate data is almost always organized by number of bedrooms with a corresponding price per square foot for each. In an ideal world, I would much prefer the information be organized by homes within a certain square footage range for greater accuracy. The reason being that for instance a 3-bedroom, 1400 square foot home will always command a considerably higher price per square foot than a 3-bedroom, 2500 square foot home. Which makes sense economically since after you have paid for areas such as the garage/utilities, bathrooms, and kitchen - areas common to both houses that cost quite a bit per square foot to construct and finish, you're then left with lower-cost areas such as a relatively simple bonus room which requires no special finish work. As such, after the baseline rate is established, the individual details and condition of the home are applied to determine what should be its fair market rent. Finally, an evaluation of other homes that are currently for rent is done to assess the current competition factor. Given that homes are nearly always listed 30 days in advance of vacancy, if the competition is currently slightly lower than what was determined to be the fair market rent, we may actually still list it at the previously determined rate if it is likely to be rented with minimal turnover time. In all instances, the measure of prospect and advertising traffic are used to both gauge a potential error in setting the rental rate and, far more commonly, confirm that the rental rate was appropriately set to maximize return.